It’s February, and love is in the air, but often times what people forget or completely overlook, is the idea of self-love and how important it is to love ourselves. Each one of us has something unique within us, something that is not to be wasted and without utilizing those unique and special qualities that make us individuals, we are, in fact, doing those around us a disservice. Maybe you’ve heard this before, but truly believing it and feeling it is crucial to our well-being. The journey of self-love is one that has always sat in the back of my mind, but it has more recently come to the forefront to play a large role in my life. I was raised to be strong and independent, to work hard to achieve my goals and to obtain a life where I don’t have to, or even want to, rely on anyone else for anything, whether it be physical or emotional. This ideal has always played a huge part in my life, and it is probably why the ease of falling in love caught me off guard, yet why I also made decisions that were best for me even when I was in a relationship that I thought was bulletproof. Maybe this is a bit of an oxymoron, but I was so invested in my relationship, while also focusing on my own agenda, such as: doing well in school, studying abroad, and planning my upcoming job search and career. Naturally, when my three-year relationship came to an end against my will four months ago, I was at a complete loss. I realized that while I always had the mentality of an independent, Chanelle and not Chanelle and her significant other, and that I could do anything I set my mind to, I had to actually feel this independence again and move forward as the dynamic of my life, my daily routine and emotional state, all changed. This felt like the most difficult obstacle I had ever needed to overcome, but it didn’t take me too long to realize that I am an array of amazing qualities and I do not need to be accepted or loved by anyone who does not appreciate all of the amazing elements that make me who I am. And the same goes for you. So began my true journey of self-love. As a term, “self-esteem” was first introduced by William James in 1890. It is one of the oldest concepts in psychology. 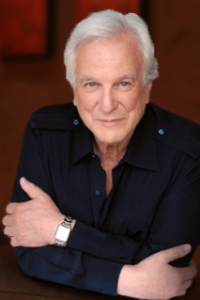 I personally identify more with Nathaniel Branden’s definition from 1969, stating that self-esteem is a relationship between one’s competence and one’s worthiness. Branden is considered the father of the self-esteem movement, and this definition sees self-esteem as the result of dealing with challenges of living in a worthy or respectable way and doing so consistently over time. There is no doubt in my mind that self-esteem and self-love go hand-in-hand and together take a journey to achieve. It is here where I find myself today, in the early stages of a, what I presume to be life-long, journey toward increasingly powerful self-love. The self-esteem movement really began in the 1960’s, when self-esteem first became an attractive and influential idea. Taking a look at Psychology Today, you’ll find that self-love is appreciation for oneself that grows from actions that support our physical, psychological, and spiritual growth. It is dynamic, and it grows by actions that mature us. When we act in ways that expand our self-love, we begin to accept our weaknesses and our strengths, we have less need to explain our shortcomings, we have compassion for ourselves, we are more centered in our life purpose and values, and we expect living fulfillment through our own efforts. It is important to understand that you cannot obtain self-love from an outside source. Self-love must be obtained by you and for you. Again, we often turn to outside sources for encouragement, reassurance, or a confidence boost, but we need to find our own reasons within ourselves to feel encouraged, reassured, and confident. Also, understand that you will not reach a full state of self-love overnight. Self-love takes time, so be patient with yourself as you walk through this journey. Understand that everyone is capable of obtaining a state of self-love, as long as they put forth the effort and give it time. Join me on this journey and together we will begin to truly seek a state of love for ourselves. Sushi can be a very healthy meal. It’s simple; it’s not processed, and it’s packed with nutrients. Amie Valpone– culinary marketing consultant, nutritionist and author of www.TheHealthyApple.com— emphasizes the importance of clean eating like this for your health. 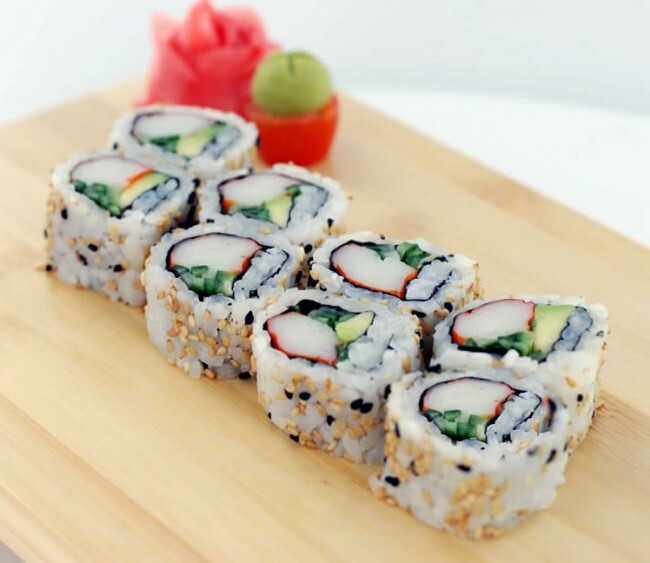 When you eat sushi, you get plenty of nutrients without any unhealthy processing, or heavy butter and cream, making it a great choice for your body! Although we already did a salmon recipe, salmon is one of the healthiest kinds of fish to eat, and a classic sushi ingredient. This time, we’ll pair the salmon with broccoli and asparagus, for a simple and healthy sushi. 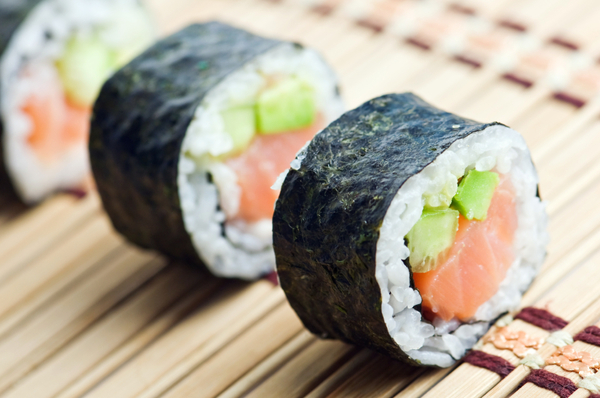 Many of the ingredients often found in sushi are incredibly healthy. Nori seaweed in particular has great health benefits; of all of the types of seaweed, it is one of the richest in protein and fiber. It also contains omega-3 fatty acids, as well as vitamin C and taurine, which can help your body maintain a healthy cholesterol level. Take a sheet of seaweed, fold, and then tear off a strip of about two inches. Spread the rice over the sheet of seaweed, leaving a border of about an inch on top and a half-inch below. If you like, you can mix brown rice with the Japanese sushi rice. Brown rice is an important source of whole grains and minerals, and can even help protect against heart disease and type two diabetes. Mixing the two types of rice will give you the health benefits of the brown rice while staying sticky enough to roll easily. Fold the bottom border on top of the rice. Now it’s time to line up the ingredients. Wild salmon in particular is full of nutrients and minerals such as selenium and omega-3 fatty acids, with low mercury content. Broccoli, in addition to being high in fiber, also contains plenty of vitamin C and folic acid. Asparagus is also a good source of folic acid, but it also provides almost an entire alphabet of vitamins––vitamins A, C, E, K, and even B6. Now bring the seaweed and rice layer to the edge of the bamboo mat, and begin to fold it over the ingredients. Once it’s folded, use a knife to cut with back and forth sawing motions, again to keep the sushi’s round shape. This is the fifth chapter from an e-book by one of the Campus Clipper’s former publishing interns, who wrote about how to make sushi. Follow our blog for more chapters from this e-book. We have the most talented interns ever and we’re so proud of them! For over 20 years, the Campus Clipper has been offering awesome student discounts in NYC, from the East Side to Greenwich Village. Along with inspiration, the company offers students a special coupon booklet and the Official Student Guide, which encourage them to discover new places in the city and save money on food, clothing and services. As much as I love making beautiful sushi, the truth is that when preparing it at home, sometimes I don’t make it formally: as usual in cooking, there’s an easy way out. Temakizushi literally means ‘sushi rolled by hand’ in Japanese, and this is because you don’t use a bamboo mat to carefully roll the sushi together. 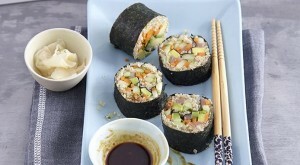 You simply take a square of sushi in one hand (a fourth of the full sheet of seaweed), and spread the rice over it with a spoon with your other hand. Then lay whichever ingredients you want to throw together on top, roll it together in your hand, and eat! It’s as simple as that. Although somewhat less satisfying to make than other types of sushi, mostly because it doesn’t look the same, Temakizushi is absolutely perfect for when you’re with a big group of people. Anyone who’s tried to order pizza for a roomful of people knows the horror of trying to compromise on food, and this way, everyone can make their own sushi to their individual taste. Vegetarians can leave out seafood, those who don’t like crab meat can go for salmon instead. In my own family, temakizushi is an easy classic. It’s the meal my mom’s family in Japan had the first time my dad went to meet them. It’s the meal we had when I went to visit several years later, with my grandmother and cousins and aunt all squashed around the small table, and the one my cousins chose when they came to New York to visit, when we had three types of fish and vegetables of all sorts from which to choose. A dish like this brings people together; this way, everyone’s pleased. This is the fourth chapter from an e-book by one of the Campus Clipper’s former publishing interns, who wrote about how to make sushi. Follow our blog for more chapters from this e-book. We have the most talented interns ever and we’re so proud of them! For over 20 years, the Campus Clipper has been offering awesome student discounts in NYC, from the East Side to Greenwich Village. Along with inspiration, the company offers students a special coupon booklet and the Official Student Guide, which encourage them to discover new places in the city and save money on food, clothing and services. For those who are doubtful of trying new things, or even just of raw fish, California rolls are a great place to start, and to introduce your friends to sushi. In fact, they were originally made “inside out,” with rice on the outside, to make sushi more accessible to Americans. 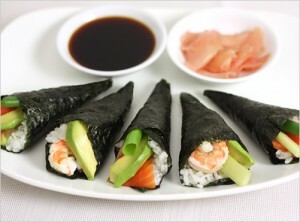 The most commonly used ingredients in California rolls are avocado, cucumber, and crab meat. The first step is to cook the rice itself, then to season it with sushi rice vinegar. Cut your ingredients so that they’re ready for use. Gently tear the seaweed into halves. Place your bamboo mat in front of you, and lay a sheet of plastic wrap, roughly the size of the bamboo mat, on top. Lay a half sheet of seaweed on top of the plastic wrap and cover it entirely with a layer of rice. Sprinkle sesame seeds on the rice for extra decoration and taste. Take another piece of plastic and lay it on top of the layer of rice, just to keep the rice from sticking to the bamboo mat. Flip the whole thing over, so that the seaweed is face up. Now peel the top layer of plastic off. Line up your ingredients in the center. Just like with the salmon roll, I’d recommend putting the avocado, the softest ingredient, in between the others; for example, surrounded by the crab meat and cucumber. Now you’re ready to roll the sushi together! Just as you would with a standard roll of sushi, pull the seaweed back so it aligns with the edge of the bamboo mat, then hold the edge of the seaweed and the bamboo mat together with your thumb and index fingers. Holding the ingredients in place with your remaining three fingers, fold the seaweed layer over the ingredients and press down. Peel the bamboo mat back, realign the sushi, and finish rolling it together. Now unroll the bamboo mat, and gently tug the plastic wrap out from inside the sushi. Leaving the plastic on the outside of the sushi, roll the whole sushi again in the bamboo mat. From here, simply cut your sushi. Because the sticky rice is on the outside, it’s easier to just cut the sushi through the outside plastic. Once you’re done cutting, pull the two edges of the sheet of plastic apart from each other and take the sushi out of the plastic layer. Enjoy! This is the third chapter from an e-book by one of the Campus Clipper’s former publishing interns, who wrote about how to make sushi. Follow our blog for more chapters from this e-book. We have the most talented interns ever and we’re so proud of them! For over 20 years, the Campus Clipper has been offering awesome student discounts in NYC, from the East Side to Greenwich Village. Along with inspiration, the company offers students a special coupon booklet and the Official Student Guide, which encourage them to discover new places in the city and save money on food, clothing and services. Let’s start with a salmon roll. For this dish, you will need: seaweed, sushi rice, sushi rice vinegar, smoked salmon, cucumber, and carrot, as well as your bamboo mat. You should also have a cup of water and a spoon ready. The first step is to prepare the ingredients, starting with the rice. Begin by washing the rice, then cook it in a pot, just as you would with any other type of rice. If you don’t have a stove, you can use a microwave instead. While the rice is cooking, go ahead and cut your ingredients into strips about three or four inches long and a quarter of an inch wide. If the vegetables are tougher, like carrots, it’s a good idea to boil them a little first so they’re easier to cut. Fold down about two inches from the sheet of seaweed and gently tear it off. Now place the large piece of seaweed horizontally on top of the bamboo mat. Dip your spoon into the cup of water; if your utensil is a little wet, it will help keep the rice from sticking. Spread the rice onto the seaweed, leaving a border of about an inch on the top, and about half an inch on the bottom. Fold the bottom border up to the edge of the rice and pat it gently, then place the two inch strip of seaweed next to the part you just folded up. From here, line up your ingredients. I generally place the carrot on the bottom, smoked salmon in the middle, and cucumber at the top. This way, your softest material is surrounded by more solid ingredients, and your fingers aren’t in salmon mush. Now line a few extra grains of rice along the upper edge of the seaweed; the rice will act like glue when you roll the sushi together. Pull the seaweed down so it aligns with the bottom of your bamboo mat. Hold the seaweed and the bamboo mat together at the bottom edge with your thumb and forefinger. With your three remaining fingers, hold the lined-up ingredients in place, then fold the seaweed and rice layer down over the ingredients. Then peel the bamboo mat back, pull the half-rolled sushi so it aligns with the edge of the mat again, and roll the bamboo mat and the sushi together completely. The roll is now finished! When cutting it, use back and forth sawing motions to help maintain the sushi’s round shape. Enjoy! This is the second chapter from an e-book by one of the Campus Clipper’s former publishing interns, who wrote about how to make sushi. Follow our blog for more chapters from this e-book. We have the most talented interns ever and we’re so proud of them! For over 20 years, the Campus Clipper has been offering awesome student discounts in NYC, from the East Side to Greenwich Village. Along with inspiration, the company offers students a special coupon booklet and the Official Student Guide, which encourage them to discover new places in the city and save money on food, clothing and services.